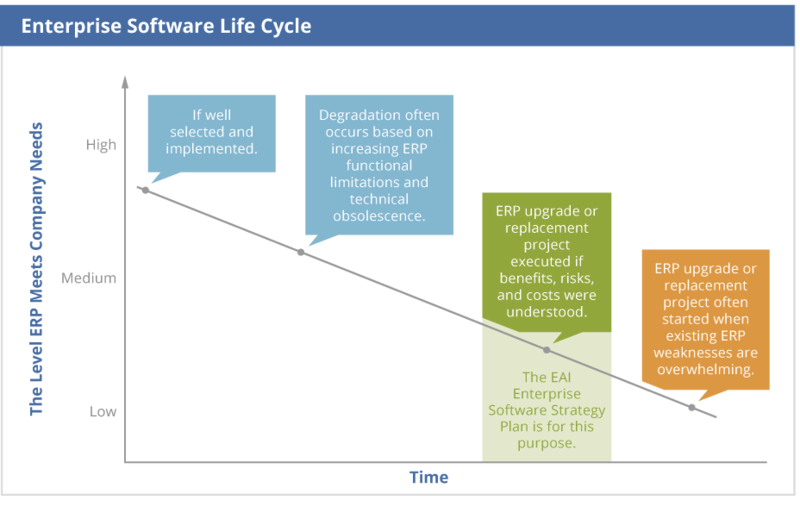 Can existing ERP software be improved or upgraded to meet current and projected needs? Are there enough deficiencies in current ERP functionality, technology, or vendor status to justify searching for new ERP software? Understanding the ERP strategy’s effects on the options and timing to improve satellite business applications expected to coordinate with ERP. Who's responsible for business software, department coordination, and change management? Without the guidance of a well-crafted Enterprise Software Strategy plan, companies tend to delay fixing business application deficiencies and in many cases are not aware of improvement opportunities. Further most business application projects are not well-planned or executed. Over time this results in a business application environment that’s unnecessarily difficult and expensive to maintain and well short of the potential of well-implemented modern business applications. Having such an Enterprise Software Strategy plan is especially important as companies enter the green zone in the chart below. Engleman Associates, Inc. offers a process to develop a realistic and defensible Enterprise Software Strategy plan. Our approach and skill is based on more than 900 ERP software projects conducted since 1996. The Enterprise Software Strategy plan is designed to improve confidence on whether a company should improve existing ERP or implement new ERP, and when-for the greatest benefit to the company. The plan also contemplates major satellite business applications that may compliment ERP-hence the name 'Enterprise' Software Strategy planning. This service offering is configured for a specific client's situation. Project Set-up Planning and Confirm/Prepare the Company Team: This includes relevant education for company team members on current-market ERP, Cloud ERP risks and benefits, techniques to comprehensively control ERP software and project costs, and more. Big picture: Discovery about the company from a big-picture or strategic level. Discussions take place in both groups and/or individual executive/stakeholder interviews as appropriate. Discovery - High-level for affected business process areas and Business Units: The business process area or business unit interview techniques are built to detect weaknesses and potential business processes opportunities related to ERP and satellite business systems. Discovery - Enterprise business application options and IT infrastructure status: This discovery seeks details about strengths and weaknesses of ERP options, satellite business applications, and overall IT infrastructure that supports business applications. Discovery Build-out and Stabilization: Further develop and organize all company findings for potential use in the Enterprise Software Strategy plan. This includes findings from the big-picture/strategic interviews, business process interviews, business application/IT infrastructure discussions and other findings. The results from the EAI team are put into this unified enterprise discovery structure to make the background information easily usable in future business application projects. Strategic Goals: Confirm, develop, and unify business strategic goals for use in influencing the Enterprise Software Strategy plan. These goals could also be categorized as enterprise goals for which many business process areas are involved to make progress toward achieving them. Key Improvement Opportunities - functional, strategic, and IT/application infrastructure. ERP Boundary Diagram(s) - Showing what business processes new or improved ERP is projected to support. Validate the Potential ERP Improvement Options - Test the strength of contemplated options. Cost, Risk, and Benefits - For potential ERP improvement options as compared to current status. Enterprise Software Strategy Recommendations - Summary of key findings. Executing the Enterprise Software Strategy - Key success factors from EAI 900 plus projects. Enterprise Software Strategy Plan Validation Workshop: This workshop is intended to 1) confirm that the Enterprise Software Strategy developed in prior steps is meeting expectations and 2) tune how it should be communicated to the larger company team that needs to approve the plan and be involved in executing it going forward. This workshop is intended to include the key company project members, selected other company team members, and one or more of the EAI consultants. Final Enterprise Software Strategy Report developed and debriefed: The report includes the components listed above in Step #5, with the bulk of the findings in addendums, referenced documents, or other sources. The final report is debriefed to the company team members. The Enterprise Software Strategy planning process described here is adjusted based on company-specific factors. Please call us if you would like to discuss your ERP improvement ideas/concerns and how our service may help.